Taron Egerton has really grown onscreen after the success of director Matthew Vaughn’s Kingsman: The Secret Service in 2015. Now the young British actor, who was also one of the nominees for the 2016 BAFTA rising star awards, has appeared opposite Tom Hardy in Legend and Oscar winner Alicia Vikander (The Danish Girl) in Testament of Youth. 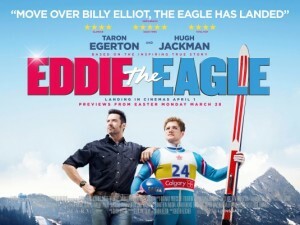 Egerton holds his own as the titular hero in director Dexter Fletcher’s humourous sports comedy, Eddie the Eagle, where he plays the hopeful and slightly gawky Eddie Edwards. Back in the Eighties, Eddie Edwards was a young British ski jumper, who against all odds and the advice of the British Olympic committee, went on to compete in the 1988 winter Olympics in Calgary and despite the setbacks managed to even garner some Olympic medals by following his constant dream of one day becoming an Olympian. Actor and director Dexter Fletcher’s film, Eddie the Eagle is a cool, coming of age sports story about the underdog, who despite his parents protests, decides that he is going to Garmisch in Germany to compete in the European ski jumping circuit. Fletcher’s previous efforts as a director have included the heart warming Scottish film, Sunshine on Leith. In Germany Eddie befriends the rambunctious ex ski-jumper, now snow plougher and heavy drinking Bronson Peary wonderfully played by Hugh Jackman (Les Miserables), who soon mentors Eddie into fulfilling his dream. The majority of Eddie the Eagle is set in the Alpine slopes of Western Europe from Germany to Austria and Switzerland as Eddie and Bronson train to compete in the 1988 Winter Olympics. 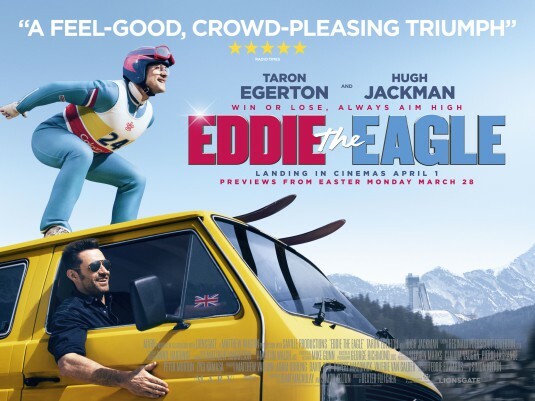 However Eddie’s quirky character, which he displays after completing the 70m ski jump, soon catches the attention of the sports press and his antics during competing soon earn him the nickname, Eddie the Eagle, by a sports commentator played by Jim Broadbent. The film belongs to Taron Egerton who superbly inhabits the role of Eddie and the rapport between Egerton and Jackman is delightful. Notable cameo’s include Oscar winner Christopher Walken as the omniscient Warren Sharp, Bronson‘s former coach who has written a bestseller about becoming a successful ski jumper and also Oscar winner Broadbent as the British Olympic sports announcer who spurs Eddie on despite the competition from within his own team. Eddie the Eagle also stars British actors Keith Allen (Trainspotting) and Jo Hartley as Eddie’s long suffering parents, Terry and Janette. Audiences should watch out for Norwegian actor Rune Temte, last seen in the historical TV series The Last Kingdom as Bjorn the coach of the Norwegian ski jumping team as well as Swedish actor Edvin Endre, last seen in Vikings, playing Matti, The Flying Finn who proves to be Eddie’s inspirational opponent. Eddie the Eagle is a highly inventive sports comedy, a feel good reach for an Olympic dream sort of tale, which proves that persistence, courage and determination really does pay off. Highly recommended viewing.